Jorgelina unfolds her knife and slices off the top of the two-liter Coca-Cola bottle with a few practiced strokes. It falls to the ground and rolls like the head of a defeated foe. She unscrews the bottle of Fernet and pours it into the makeshift goblet along with a block of ice she had in her backpack. We pass it back and forth between the four of us, drinking one last glass together as we wait for the sun to drop into the ocean. There are a lot of pilgrims there, on the rocks beyond the Finisterre lighthouse. 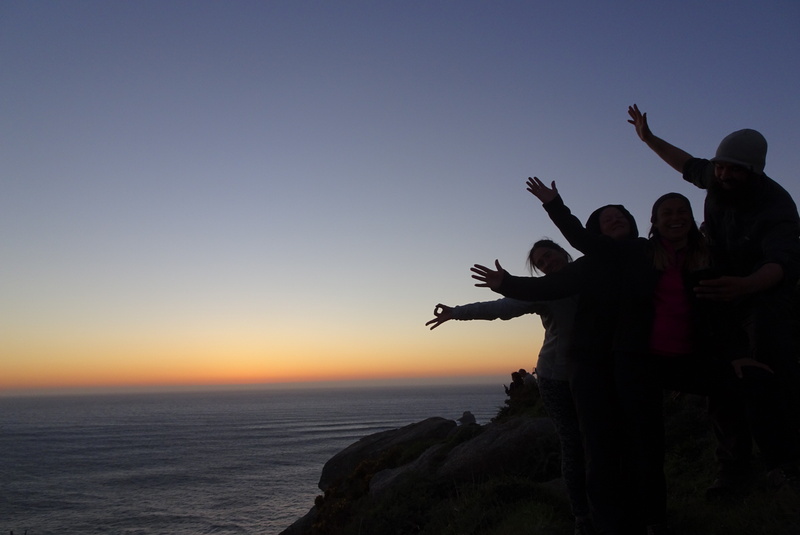 We are all waiting for sunset at the third and final end of the Camino, a place where people once thought the world itself ended, or at least Europe, before some stubborn cartographer discovered that Portugal’s Cabo da Roca leans a smidge farther out into the sea. The bitter, liquorice-like taste of the Fernet reminds me of the six months I spent in Argentina after the Continental Divide Trail. I thought it would be good to spend time writing, time digesting that last hike of the triple crown. Instead, I barely filled a page and spent far too long staring at an empty computer screen. I did learn a bit of Argentine slang though, words like che, boludo, and quilombo that make Jorgelina laugh everytime I throw them out. I also learned about Fernet and how it’s almost a national drink down there. I found the bottle in Muxía, half hidden on the bottom shelf of a grocery store. I thought I’d probably find another in Finisterre, but probably wasn’t close enough to sure so I bought it there and stuffed it in my pack for the last two days. Jorgelina’s memory-filled smile when I pulled the bottle out made it worth every ounce. A bit of home, far, far away across a sea. We pass the makeshift goblet and watch the sun slip away. We laugh and tell stories about how we met, about moments we will always remember, about the miles we shared to reach the so-called end of the world. Underneath each word is the unspoken knowledge that these are our last hours together. Tomorrow morning, Jorgelina and Amelie will get on the bus back to Santiago, Daya and I will walk south toward Portugal, and the four of us may never be in the same place again. The bottle empties and we refill it. A bit more coke, a bit more Fernet. There is still ice and the sun hasn’t disappeared yet. We pass it back and forth again, tell more stories, watch the sun slip toward the sea, and wait together for the Camino to end. No rum or Cuban cigars? Que lastima!! But great story and friends. Que bueno! And that is wonderful picture. I am delighted to know you have had such a soulful band of trail mates on this Camino leg of your European sojourn! After almost two thousand miles of cold rain in Norway and Sweden, it’s great to see you enjoying the pleasures of good food and good company. I imagine your heart feels heavy as this chapter closes. But also full of amazing memories of the Camino!